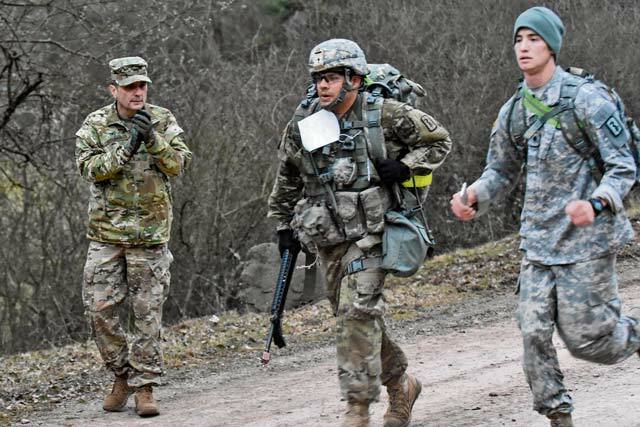 Col. William Stubbs, 30th Medical Brigade commander, cheers on Soliders during a 12-mile ruck march that was part of the U.S. Army Europe Expert Field Medical Badge event March 24 at Baumholder. Twenty-three allied candidates earned the prestigious Expert Field Medical Badge after a week of grueling testing conducted by U.S. Army Europe and 421st Medical Battalion personnel March 24 in Baumholder. Candidates who earned the badge came from the 21st Theater Sustainment Command’s 21st Special Troops Battalion, 16th Sustainment Brigade, 30th Medical Brigade and 18th Military Brigade as well as the Landstuhl Regional Medical Center, 173rd Airborne Brigade Combat Team, 10th Army Air and Missile Defense Command, Regional Health Command — Europe, 2nd Calvary Regiment and the Danish army’s 2nd Medical Company. The spring 2016 EFMB event began “standardization week” with 193 candidates. After four days of rigorous testing, 28 candidates stepped off the starting line of the 12-mile ruck march. Twenty-three candidates crossed the finish line in time to earn their badge. Command Sgt. Major Sheryl D. Lyon, U.S. Army Europe senior enlisted leader, thanked the cadre who supported the EFMB and praised the candidates for their hard work and achievements during an awards ceremony held after the last event. “Each and every one of you are winners,” Lyon said. Special recognition went to several candidates for their unique achievements. Capt. Diana Rommelfanger of LRMC scored 95 percent on the written test, the highest overall score among the 193 candidates. Pfc. Ralph Fontanez of the 173rd ABCT received the most “GO’s” in the competition, exceeding the standard for required tasks per combat testing lane among his peers. Spc. Marco Fonseca of the 173rd ABCT was recognized not only for earning the prestigious badge but for being the first among the 28 candidates to cross the finish line after completing the required 12-mile ruck march, with a time of 2 hours, 23 minutes. Fonseca attributes his success largely to the support of a strong senior medic. He recommended future EFMB candidates also enlist a strong mentor. “Study, study, study, and don’t quit,” Fonseca said, offering additional advice for aspiring EFMB candidates. Soldiers and family members came to hold up encouraging signs, cheer and even pace their EFMB candidate during the culminating march. Others followed the event via various social media platforms, such as Snapchat, Instagram and Facebook. Organization communicators featured highlights of the ruck march and the awards ceremony in their products, allowing Soldiers, family members and the candidates’ units to follow the action as it occurred. Candidates who participated received training that is not normally part of their country’s military training during standardization. Each NATO candidate who earns the EFMB becomes a subject matter expert available to their country’s military to help prepare the next batch of candidates for success. Competition officials said they conduct the USAREUR EFMB biannually. Allies are cordially invited to participate, they added.